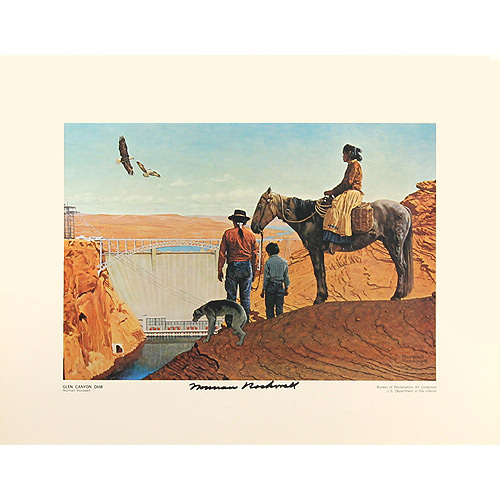 This limited edition color offset print entitled Glen Canyon Dam measures 16" x 20" inches and was hand signed by Norman Rockwell on the bottom middle of the print in permanent marker. This print is in very good condition with vibrant color, detail and clarity. The original painting was commissioned by the Bureau of Reclamation in 1969. "I am a people painter," Rockwell said, "not a landscape artist. You would like a painting of Glen Canyon Dam, I suppose. But if I do it, I'm afraid it might look like a mechanical drawing - lifeless... unless, perhaps, I could work some people into it?" Soon Rockwell had conceived the notion of using a trio of Navajos, the woman on a horse, the man standing and holding the hand of a small child on his right, his left hand holding the horse's bridle. The group would be perched near the canyon rim.